1. Take 2-3 cups of water in a pressure cooker and add daal. 3. Heat oil in a pan. Add mustard and wait till it splutter. Then add red chillies followed by garlic. 5. Add chilli powder and saute for a minute. 6.Add tamarind (vaalan puli) water and let it boil. 7. Mix all these into the daal and boil it to adjust the consistency of the curry. You can saute some Spinach (paalak) after step 5 and add into this, if you like spinach. This curry goes well with rice and rotis. Note: If you do not want to add tamarind, use more tomatoes instead. Hey Nami, this looks quite exciting! Will definitely give it a try... Looks so tasty! Fantastic Nami.. I tried it and added some zucchini to it cos I din't have any spinach. It tasted yum so had it with roti and okra. Okra recipe coming up! 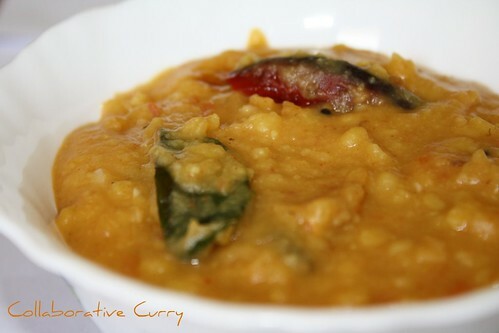 I was looking for this basic daal curry.Actually here we make daal curry like our kerala Erisheri using moong(cherupayaru parippu).I wanted to try it the toor daal version ,thanks for putting it up...And nice snaps too. @nostalgia : Glad that you liked it. Actually Andhrites add different types of vegetables in it, one at a time. Yummy yummy yummy in my tummy! I love Parippu curry and now I have somewhere to check out a recipe, thanks..defin will try it and let you know..
when you cook parippu with Spinach, you can try adding coconut and a bit of Jeera after grinding, to it. @Sudhi: Thanks for visiting and also for the suggestion. I haven't tried it yet though I use coconut and jeera for cherupayar parippu..
@Touch me not: Thank you ! Great attempt Namitha.... The pappu reminds me of the hyderabad life! The blogs got an excellent look. Good work....I too follow the same recipe & my hubby taught it..I think its an Andhra recipe.. This picture looks yummmy....my way of prepairing parippucury is with coconut...but my husband donot like it... Im sure this parippucurry will defenetly sortout that problem soon...thanks namithe!!! 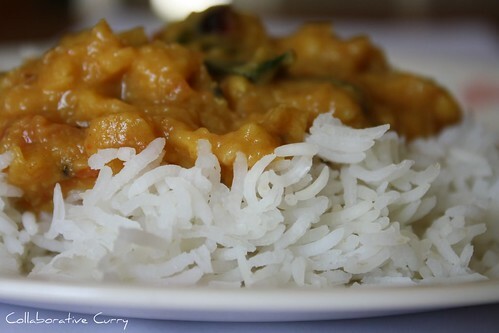 Your blog looking very good and your blog provides different types of curry techniques.I much like 'Parippu/Pappu curry',It is very tasty and cooking recipes very easy.Thanking you providing the information.